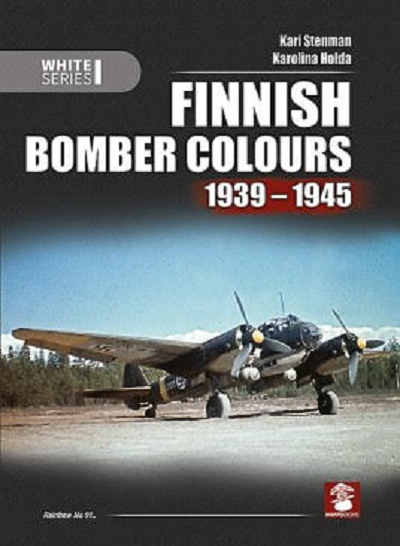 ​This latest book in the Rainbow Series covers Finnish bomber aircraft deployed during WWII. Camouflage and markings on the bombers obtained from USA, Netherlands, German, UK and the USSR are described in unparalleled detail by well-known Finish author Kari Stenman. The book features many previously unpublished photos, and exclusive colour profiles for this book by Karolina Holda. MMP (Mushroom Model Publications) is based in the UK. All their books are printed in English by their associate Stratus in Sandomierz, Poland. Stratus also does their own line of books in both English and Polish. The book is hard-cover of 224 pages in 8" x 11 1/2" page format. Finnish Ju-88 sitting on a dirt field with a forest in the background. It is in a wave pattern of 2 shades of green over a light-blue undercarriage It has yellow spinners and a yellow fuselage band. The fuselage side has a white JK-266. It is carrying two 1000 kg bombs. Fokker C.X biplane (38 black and white photos, 8 color profiles and 2 3-views) Plus 2 data listings. Bristol Blenheim I, II & IV (82 black and white photos. 1 color photo, 18 color profiles and 3 4-views) Plus 3 data listings. Ilyushin DB-3M & DB-3F (29 black and white photos, 2 color photos, 8 color profiles and 2 4-views) Plus a data list. Douglas DC-2 (9 black and white photos, 4 color profiles). Westland Lysander I (19 black and white photos, 3 color profiles and 4 4-views) Plus a data list. Tupolev SB (39 black and white photos, 2 color photos, 4 color profiles and 3 4-views) Plust a data list. Dornier DO-17Z (34 black and white photos, 6 color profiles and 3 4-views). Petlyakov Pe-2 & Pe-3 (22 black and white photos, 6 color profiles and 1 4-view) Plus a data list. Junkers Ju-88A (47 black and white photos, 3 color photos, 8 color profiles and 3 4-views) Plus a data listing. The German aircraft listed above are all ones that were captured and used by Finland. The appendices includes a table with the types of colors identified by code, a color illustration of the Mannerheim Cross medal, a list of Finnish missions and 7 photos of Finnish aces. A Fiat G.50-II Freccia Finish Aces, kit no. SH32044 in 1/32nd scale. A Fokker D.XXI 4 Sarja, with Wasp Junior engine, kit no. SH48073 in 1/48th scale. A Fokker D.XXI 3 Sarja, with Merury engine, kit no. SH48078 in 1/48th scale. A Fokker D.XXI duo pack, kit no. SH48124 in 1/48th scale. A Heinkel He-115, kit no. SH48146 in 1/48th scale. A Fokker D.XXI 4 Sarja, kit no. SH72113 in 1/72nd scale. Fouga Magister seats (2 pieces) resin, Q72227 in 1/72nd scale. Fouga Magister wheels, resin, Q72228 in 1/7nd scale. Fouga Magister CM.170, aircraft, SH72373 in 1/72nd scale. Folland Gnat F.Mk. I, Sh72137 in 1/72nd scale. Folland Gnat F.I ejection seat, resin, Q72236 in 1/72nd scale. Folland Gnat F.I control surfaces, resin, 7332 in 1/72nd scale. Blenheim Mk. I fixed type ski undercarraige, resin, 7344 in 1/72nd scale. Blenheim Mk. II Finish type bomb bay doors, resin, Q72259, in 1/72nd scale. Blensheim Mk. II Finish AF-2 conversion set, resin, 7345, in 1/72nd scale. A Fokker D.XXI 4 Sarja, SH72116, in 1/72nd scale. A Blackburn Roc Mk.I, SH72141, in 1/72nd scale. A VL Myrsky II re-edition, SH72161, in 1/72nd scale. A MD-500E Helicopter, SH72346, in 1/72nd scale. A DC-2 rebuilt bomber, 72527, in 1/72nd scale. ​This is one neat book. It will be of great interest to aircraft historians and modelers alike. I want to thank Dr. Roger Wellsgrove Editor-in-Cheif of MMP books and the folks at Casemate Publishing who sent me this sample.